Over the past 8 months, with the backing of Whitefield Rising, guidance from experienced professionals, and increasing participation from a diverse range of volunteers, BEMBALA (meaning support in Kannada) has coalesced into a group of like-minded individuals whose purpose is to help women and child survivors of all forms of violence. This new initiative has just set up space at Vydehi Hospital on Jan 30th, and will be able to address a long neglected area of support for women and children. 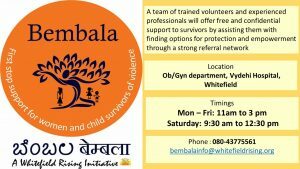 The idea for the launch of Bembala dates back to an event in March 2018, when a number of people attended a session called “Break the Silence” that was hosted by Whitefield Rising and covered the topic of ‘Domestic Violence’. The panel discussion was headed by a very eminent gender specialist and professional counselor, Kiran Bhatia. She was joined on stage by a group of women who work at Vimochana, an NGO whose work with women in distress for the last 30 plus years in Bangalore has been exceptional. Many stories were shared that day, and the key takeaway was that each woman and child, each survivor, had unique needs that had to be taken into account while responding to them. Inspired by the panelists and with the energy generated from this March meeting, a group of women decided to start work on creating and launching a support center for women and children. On June 23rd, the name ‘Bembala’ was formally announced to an audience of nearly 30 women and men, and this initiative was officially launched. Ably mentored by Kiran Bhatia and senior counselors Iram and Smita, over 20 volunteers have been trained in the past few months to become “befrienders”, who will offer free and confidential support to those who have faced violence. In addition to offering a ‘listening ear’ that would help the survivor gain clarity and insight, they will assist them with finding options for protection and empowerment through a strong referral network of counseling, medical/legal aid, safe shelter, police intervention, etc. as required. Several other Bembala volunteers have spent the last 8 months strengthening partnerships with relevant referral agencies and NGOs to collectively assist survivors. 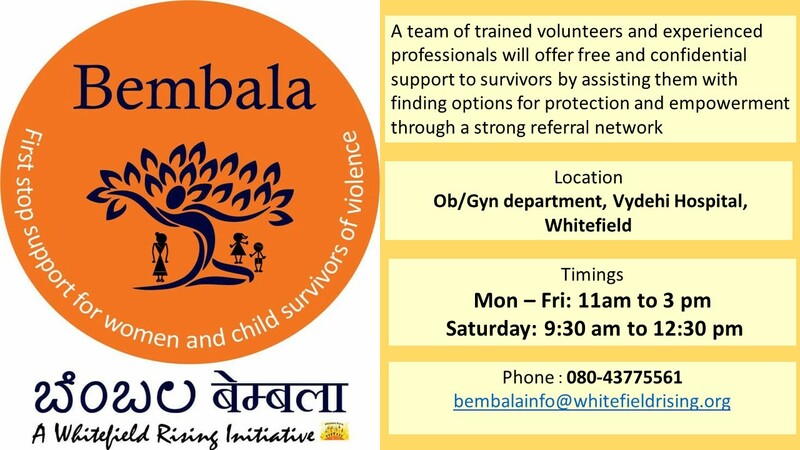 With volunteers working on befriending, referral coordination and community outreach, Bembala hopes to bring services from the margin to the center for women and children survivors of violence of Whitefield and Mahadevapura.